Following the initial launch of Saint and Sinner came two further KVD scents, Adora and Poetica…although there’s no word as yet as to if these guys are also up for a comeback, but who knows and here’s hoping! I loved them both the first time around and wore them mixed together a lot (these lend themselves really well too a bit of mixing and layering as well as wearing each alone), but was definitely more of a Sinner girl a heart. This time around I still decided to pick up a full bottle of each and also a handbag sized Sinner for on the go and travelling, I couldn’t resist! Aren’t they beautiful?! Kat herself spent months perfecting and hand sketching every last detail of the revamped bottles and I’m obsessed with how they ended up! 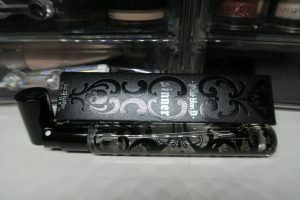 The full size scents (50ml and 100ml) are housed in glass bottles, partially encased in a textured sculpted filigree and skull design as well as the Kat Von D signature logo. 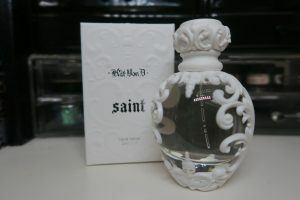 Saint comes in a clear glass bottle with white detailing and Sinner in a smoked glass with black detailing. These gorgeously designed bottles are works of art in their own right! Kat also had in her mind that she wanted the specific shape, size and weight of the bottle to be reminiscent of an anatomical human heart when held in her hand which adds to the whole ‘every little detail thought of’ element to her packaging too which she clearly feels holds an equal importance to the products themselves. From a fellow artist, I really appreciate things like that! Both fragrances are inspired by Kat’s own duality…her tough and fierce, strong tattooed boss lady side and her softer, more vulnerable and romantic side. 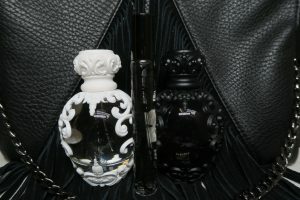 As I mentioned before, Saint and Sinner are also available in a smaller (10ml) handbag and travel friendly spray bottles. The OG Saint and Sinner travel size came in roller ball form, I definitely prefer the relaunched mini spray instead. 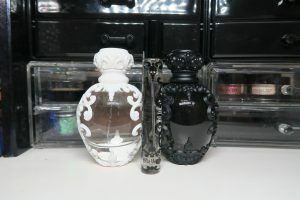 Both are clear glass with Saint having a white cap and filigree/ skull painted design, while Sinner is the same style but in black. Cruelty Free and Vegan Fragrance. Base: Vanilla, Sandlewood, Peach Skin, Musk. Base: Patchouli, Vetiver, Cedar (Wood), Vanilla, Musk. 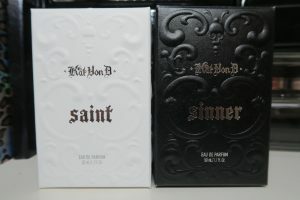 Kat Von D Beauty claim to have stayed true to the OG Saint and Sinner scents. I don’t have anymore of either left over and even if I did, a perfume’s scent would change and slightly spoil with time, so I don’t know how you could fully test that claim out. From memory, I do feel like there has maybe been a few subtle adjustments to the formula but in my opinion if there has been, it’s for the better. Saint (Gourmand Oriental) is a lot sweeter and softer than it’s edgier ‘a little sweet, a little spicy’ darker and more sultry Sinner sister, but not too sweet (personally not a fan of super sweet scents!). It’s musky vanilla base makes it warmer and almost creamy and addictive, not sickly sweet at all. I feel the OG Saint was maybe a little more sweet from memory, so I think I actually prefer this version myself. Sinner is right up my street and I feel most similar to the OG, although maybe it’s slightly less of a Patchouli fest instead allowing the musk and wood base notes to take the lead. Again this is a plus point for me and if my shnoz memory serves me well, I prefer this one to the OG version too! If I was forced to pick only one (hard for me) Sinner would be the one, addictive and empowering I can’t get enough! Saint and Sinner are both Eau De Parfum which makes them both stronger in scent and longer wearing on the skin. I can actually smell both still lingering on myself (which you often get nose immune to and are more likely to notice fragrances on others than yourself) after a days wear. I’d suggest if you were unsure of which to go for, get yourselves in store and actually test them on your skin while you go about your business for an hour or two to see how each scent develops. If you can’t make it in to store/ don’t have a KVD counter near you, that’s the beauty of the handbag size, not as much of a commitment and you can experiment without too much of a dent in your wallet. I’d definitely recommend mixing these two complimentary beauties too, a magical fusion of the two could be just what you’re looking for! I’m so happy Saint and Sinner are back in my life! Are you Saint, Sinner or both? Thoughts…are you planning on picking one or both up, did you love the OG’s and how do they compare for you? Kat Von D Saint and Sinner Fragrances are available in UK/ Ireland Debenhams stores now and online from Tuesday 18th July (UK*/Ire*). I’m off to bathe in both! ✌?